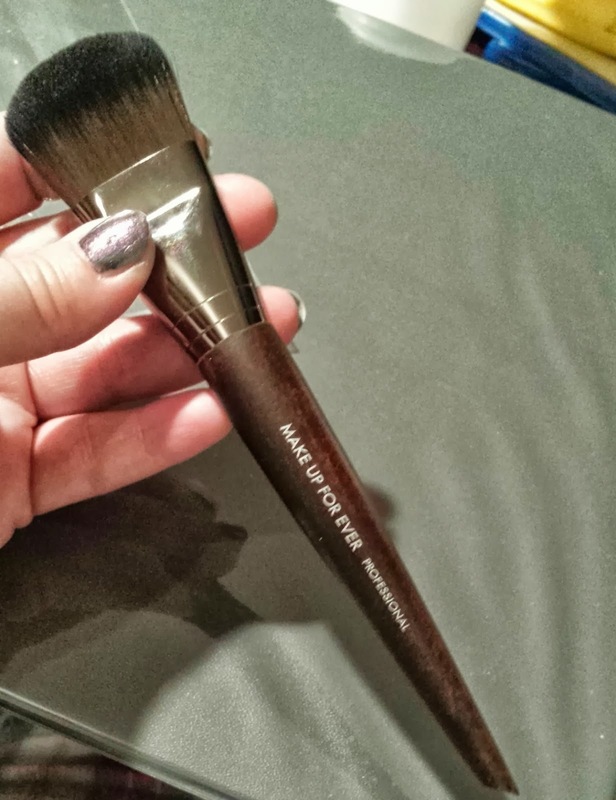 MAKE UP FOR EVER just released a new line of Artisan (makeup) brushes and they are amazing! I was in Sephora yesterday when I spotted the brown wooden handles from across the store. These lightweight brushes are easy to handle and just as gorgeous in person as they look in the promo pics. The 108 large foundation brush currently retails for $36.00 USD which is a little on the cheap side considering this is the LARGE version - the 106 medium foundation brush retails for the same price. The synthetic fibers of the brush are extremely soft and allow for a smooth and streak-free application of my liquid foundation. I didn't notice any stray fibers or shedding on my face which is a huge plus in my book. The brush fibers did soak up some of the liquid foundation but it was minimal at best. The wooden handle of the brush seems to be hollow near the end with the weight of the brush centered at the middle where the metal ferrule meets the handle. Most makeup brushes that I own, the weight is distributed evenly along the brush handle so this is a welcome change. Although others might find it takes them some time to get comfortable using them. Overall I am really impressed with the quality of this brush. When applying your foundation, Sephora suggests dotting your face with your liquid foundation and then using this brush to blend it in - which works great! However, what I find works best for me, is to dispense a small amount of liquid foundation onto a sanitary surface and then dip my makeup brush into the foundation. Then I apply and blend it into my face with the end result being a beautiful and flawless foundation application. 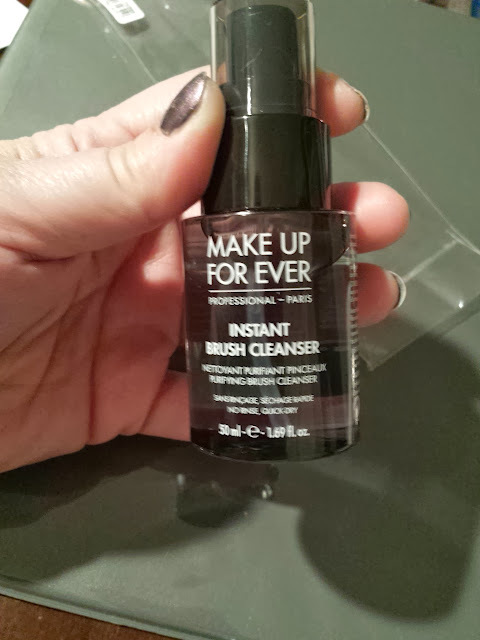 When it comes to maintaining and cleaning the MAKE UP FOR EVER ARTISAN brushes it is very important to purchase the brush cleanser as well. It is specially formulated specifically for these synthetic fiber brushes. The travel size currently retails at $12.00 USD for 1.69 oz. The Make Up For Ever Artisan brushes are currently available at all Sephora stores and online at Sephora.com. If you are making an in-store brush purchase please be sure to carefully look over the brush for defects or anything out of the ordinary. As you can see below, there is a small gap where the metal ferrule meets the wooden brush handle. 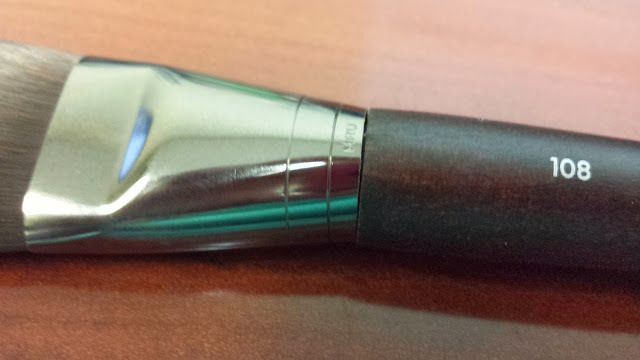 It is only on one side but repeated use with this brush could allow for dust, water, makeup, etc. to accumulate around the opening and damage the integrity of the brush handle. An alcohol-free brush cleanser that instantly purifies and removes all make up textures. Perfect for synthetic and natural hair brushes, Travel Instant Brush Cleanser cleans quickly without rinsing and dries on the spot so brushes are ready for immediate reuse. Its unique formula dissolves even the most waterproof and highly pigmented products while refreshing brushes with a mint-oil extract. -Spray Travel Instant Brush Cleanser on a tissue and wipe brush. -Use a dry tissue to remove excess cleanser from the brush.